Do your children love dressing up? 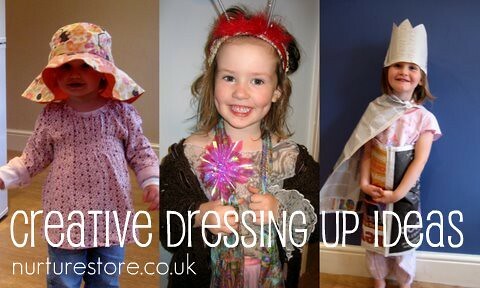 Along with building dens, dressing up is one of our all time favourite ways to play. I wonder just why children find dressing up so much fun? I think perhaps it makes their play come to life even more if they’re kitted out in the right costume to really get into character. Mine like to match their clothes with their play sometimes – so they’ll wear a hardhat when they’re playing with the trucks – but often they like to accessorise and customise their outfits to see them through the whole day, whatever they’re playing. Ditch the Disney? Don’t feel you have to go all out for shop bought fancy dress costumes. These can be very expensive and I find the fabric, and especially any net, can be itchy and not hard wearing. They’ re also difficult to wash. Although both my two enjoy dressing up in a princess dress sometimes, I think these themed costumes can be a little limiting as all the deciding and customising has been done for you. Gather props from your own wardrobe, grandparents and charity shops – much cheaper and I always find children enjoy getting their hands on ‘real’ grown-up stuff. Go for simple, open ended options. Pieces of fabric and scarves provide lots of colour and texture and let your children decide what kind of costume they want to put together. These items are versatile so give lots more play options too: a piece of material can be a cape, a skirt, wings, a hat. Think about including items from different cultures and styles of dress: headscarves, tunics, saris, and different patterned materials. Hats are a great option as they’re so easy to for children to put on and take off by themselves, so even toddlers can join in and design their own outfit. We have woolly hats, flap caps, hardhats, sun hats, crowns and a chef’s hat. You might like to add in some things the children can use to fasten the fabric together – kilt pins and safety pins work well as do ribbons and scarves, and my two have been known to use hair bobbles and clips too. How about trying something a bit different and designing a costume made from newspaper? Bear in mind your own approach to this kind of play. Dressing up is one area of play where I often see adults treating girls and boys differently. Do you offer children different costumes depending on whether they’re a boy or girl? Maybe you can have all the resources available and let the children decide who they’re going to be? Great ideas! I like the idea of fastners. Thanks JDaniels’s Mom – I try to give them something they can manage themselves without risking any mishaps like getting spiked. The favourite here is a bunch of African Kangas we have from when my parents did mission work in Kenya. They get used for all sorts of things, they are so multi purpose (there is another word on the tip of my tongue but the TV is too loud for me to think). The kids all enjoy any type of cloth and they love hats and accessories like bags and beads. Andi – the kangas sound perfect. I bet my two would love them. I love it! I’m going to go dig through my old clothes! I love that you used newspaper. My little one has been running around with a racerback athletic top of mine. It looks like a dress on her and she loves that it is purple. You just never know where their little creative minds will take them. Dress up definitely looks fun at your home! My girls LOVE dressing up. They have just been given some Tinkerbell dresses, which they’ve worn for three days. I don’t mind the Disney stuff as they like to delve into their Dress Up box and make costumes from my old clothes, material, scarves and accessories just as much as they like a princess dress. Just the other day my husband made a skirt out of a banan tree leaf, which was a huge hit. Our girls love dressing up as well, definitely our most used ‘toy’ in the house! Every few weeks we go to our local op shop and they get to choose a few things each to add to the box, it’s interesting to see what they pick out. Love your idea of fasteners, my two are a bit little for safety pins yet but I’ll be finding some pegs or bulldog clips to add in there for sure! nice, innovative ideas…thanks for sharing! Lovely post. Great summary of all the opportunities for dressing up. My kids LOVE dressing up. My little boy’s current fav is a piece of brown cloth which I safety-pin to his t shirt at one of his shoulders and arm and voila – he’s a perfect Jedi padawan. My fav outfit was when my daughter dressed up as the Queen (ER II) with stuff from the giveaway stash. She had a head scarf, tiara, handbag, one of my old dresses and found two cuddly toy dogs as corgis. I have a photo somewhere. Still makes me chuckle thinking about it. My two year old is starting to get into dressing up! Lots of great ideas here. I need to remember to stop at my local Good Will store. My son is the dress-up king in this house. It’s either “fancy” for parties with scarves and what not or “dangerous” for fighting battles with belts and a thousand weapons. My dress up box for the Grandchildren came from many Yard Sales. People are always selling last years Halloween costumes for a $1-$3. Also old T-shirts cut up make great Ninja bands. Little trinket bags or boxes keep small items organized. 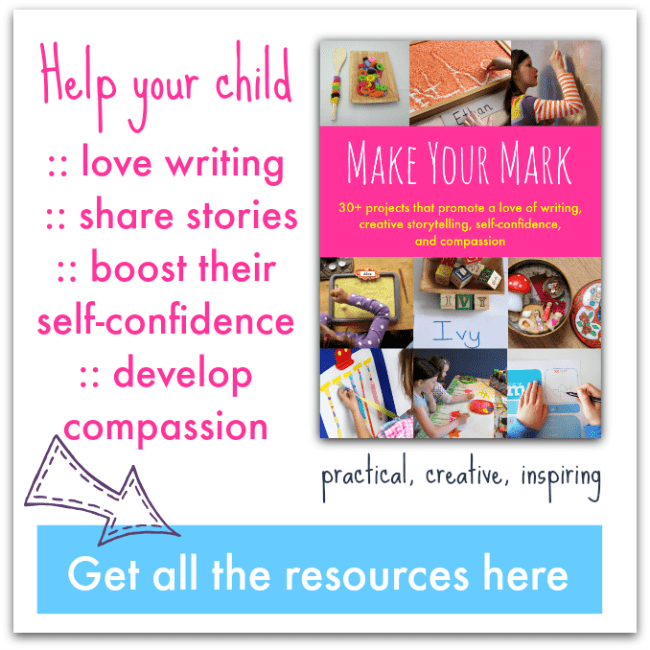 Love these ideas Terri – thanks.